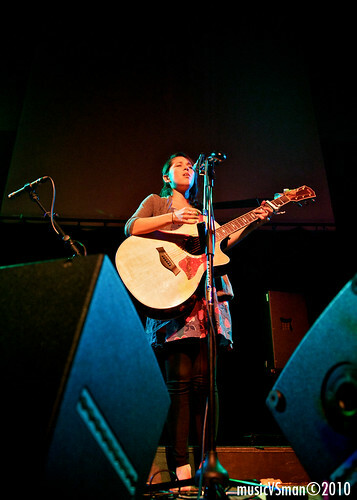 Let’s flashback a few weeks earlier when my friend Dan asked me, “Hey are you going to see Kina Grannis?” My first response – “Who’s Kina Grannis?” I’m sure a few of you would have said the same, so let me get you up to speed. Remember in 2007 when Doritos aired a music video during the Superbowl? That was hers (“Message From Your Heart“). 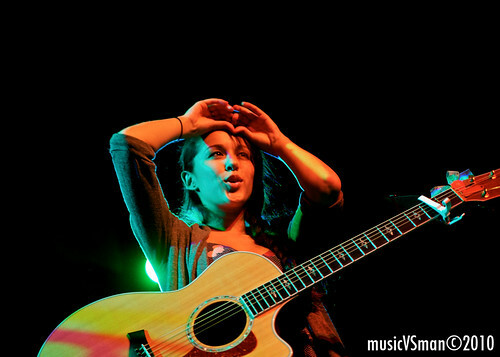 Also, if you came out to the Lilith Fair this year, you might have caught the California-raised songstress there. 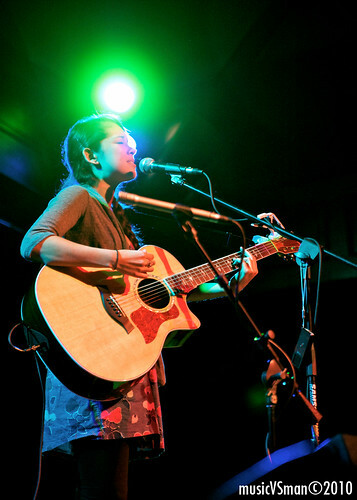 Fortunately, the sudden explosion of attention doesn’t seem to have changed her simple and sincere acoustic guitar and vocal delivery, reflective of the personal YouTube delivery model that got her noticed in the first place. 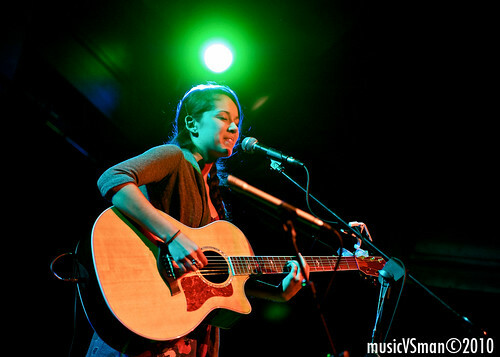 After covering tons of rock and indie shows lately, Grannis turned out to be a great palette cleanser. No wild crowds. No distracting side conversations. 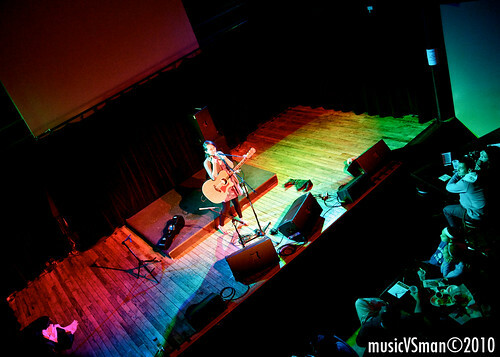 Just a quiet and attentive crowd seated to make sure they could enjoy the beautiful set of songs Grannis had to offer. A great night to just chill out after a busy week, enjoy a drink, and enjoy some great tunes. More random notes after some pictures. 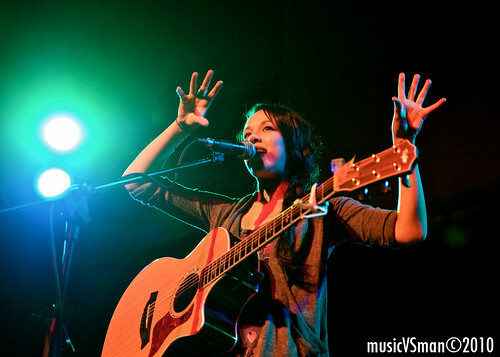 -Grannis cancelled the previous night’s show in Lawrence, KS due to a cold that made her lose her voice, but felt well enough to treat the crowd at the Old Rock House that night. You could kind of tell she was under the weather during the first few songs, but by mid-set her vocals seemed completely fine. At the end of her set, she held a meet and greet but warned that hugs would be given at risk of getting sick. I overheard some young kids at the next table telling their parents they were willing to risk getting sick to get a hug. Cute. -Very interesting fanbase. I expected the college and young adult female demographic, but definitely was surprised to see everyone from grandmothers to grandchildren represented in the crowd. As well a very devoted fanbase, as she told us how her street team chipped in to buy her a replacement ukelele after it was stolen. 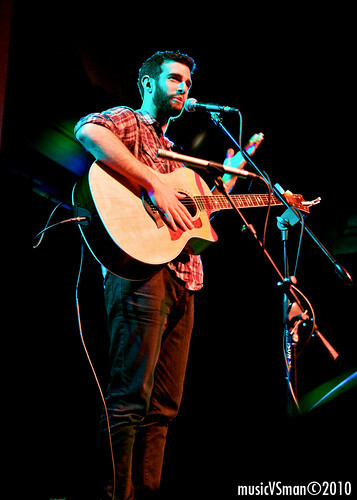 -Opening the set was Imaginary Friend, with a similar folk style, but generally more melancholy tone.